Heavy Duty Stainless Steel: every part is of high quality and durable, make sure your timber posts railing can be used for many years. This Kit provides the completed kit to finish your cable railing project. Perfect for fixing 1/8 inch (3.2mm) stainless wire rope cable to timber posts. 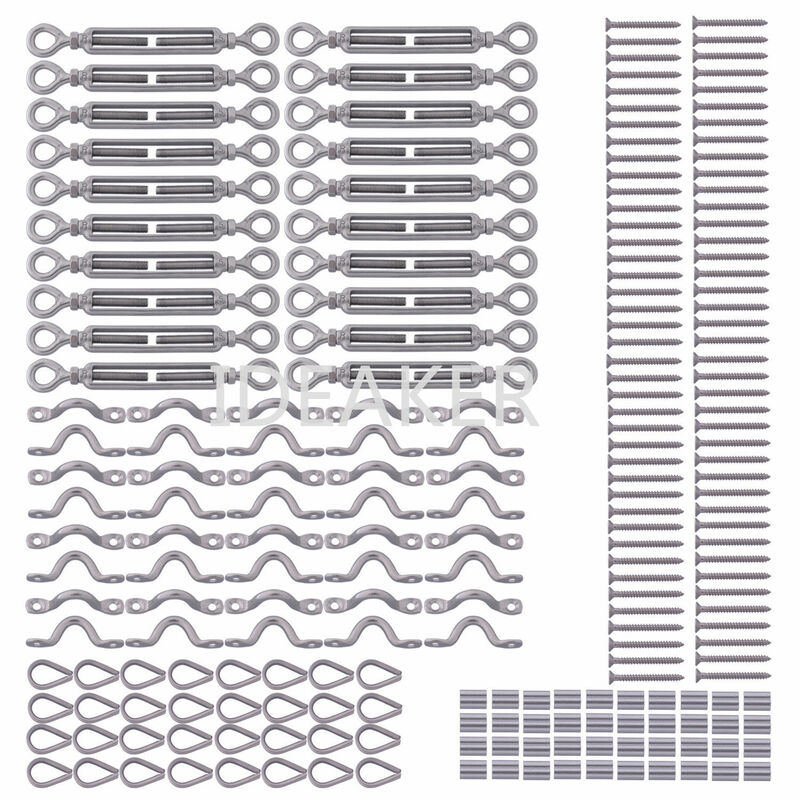 Cable Railing Kit Comes with 20PCS M5 eye/eye turnbuckle, 40PCS M3 Wire Rope Thimbles, 40PCS M5 Wire Eye Straps, 40PCS Nickel Plated Copper Swages (Ferrules) and 80PCS Self Tapping Screws Countersunk Head Phillips Drive. Good Quality turnbuckles: High tensile strength and Anti-fatigue strength. Use these accessories to build the railing will be easy and simple, you can make a railing for your garden, stairs and aisle, the railing will look amazing. Suitable for outdoor applications of tent rope, clotheslines, hanging outdoor lights, deck cable railing and etc. Manual measurement, there may be 1-3mm error. There could be some slight difference in the color tone of the pictures and the actual item due to the lighting effects, monitor settings, etc. When you place an order, please choose a shipping method and pay for the order including the shipping fee. We will send the items within 5 days once your payment is completed. We offer the 1-month free replacement. Buyers may request for a replacement within 7 days from your receipt of the product . The buyer should return the product in the original conditions to us and should bear the shipping costs for return.